Speed: Max: 7 knots, Avg. 4 knots Complement: 106 men Class: Not listed. Namesake: Charles Morris was born in Woodstock, Conn., 26 July 1784, and served in the Quasi-War with France, Barbary Wars, and War of 1812. 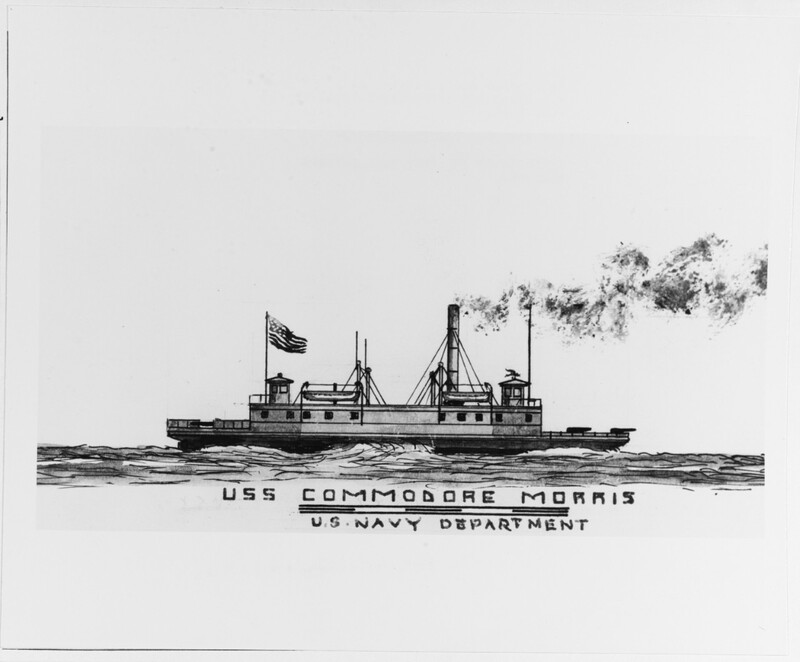 Commodore Morris served as a Navy Commissioner from 1823 to 1827, and as the Chief of the Bureau of Construction Equipment, and Repairs from 1844 to 1847. He died in Washington, D.C., 27 January 1856. Assigned to the North Atlantic Blockading Squadron, Commodore Morris’ entire service was in the rivers and creeks of Virginia. Serving on patrol, and as picket, she also transported troops, dragged for mines, towed disabled ships, and sent parties ashore which took prisoners and food supplies. Several times she engaged Confederate installations and cavalry ashore, most notably in the action with batteries at Trent’s Reach on 16 May 1864 and near Malvern Hill on 14 and 16 July 1864. Brett, I absolutely love this new series of posts. The amount of work you have put into it is amazing. As I am sure you would expect, after I read each day’s article, I look to see if there is a connection in my cache of letters. Today – found one! “We are expecting to move our camp this evening. I do not know where we will go. This is quite a pleasant place and I would prefer to remain here although we are in shelling distance of the enemy Gunboats and when annoyed by our artillery they sometimes shell us. They honored us with their attention yesterday and we had to move a short distance farther from the River but soon returned. It is amusing to see how “wild” the men look when a tremendous bolt making a most unearthly sound comes over us and falls near the camp. Some jump behind trees, some fall flat on the ground, and all stare about in the air like a flock of barnyard chickens when a hawk flies over. It is so fascinating to find connections. I continue to find tons of connecting material throughout your website. Thank you Lisa! I still have a few more to finish up, but as of April 10, I have ships scheduled to post one a day until late June! Every single one spent at least some time on the York, James, and/or Appomattox Rivers during the Siege of Petersburg. The Confederate ships will be out soon, followed by many, many more Union vessels.